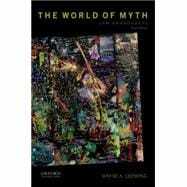 Since its publication in 1991, The World of Myth has provided thousands of students with a fascinating, wide-ranging introduction to world mythology. Building on the bestselling tradition of the first edition, the long-awaited second edition offers a uniquely comprehensive collection of myths from numerous cultures around the globe. Featuring a thematic organization, it helps students understand world mythology as a metaphor for humanity's search for meaning in a complex world. Author David Leeming presents a sweeping variety of myths whose origins range from ancient Egypt and Greece to the Polynesian islands and modern science. Students will be captivated by stories of great floods from the ancient Babylonians, Hebrews, Chinese, and Mayans; tales of apocalypse from India, the Norse, Christianity, and modern science; myths of the mother goddess from Native American Hopi culture and James Lovelock's Gaia; and much more. One of the most wide-ranging anthologies available, this volume includes myths from African, Australian Aboriginal, Aztec, Celtic, Chinese, Greek, Hittite, Japanese, Muslim, and Persian cultures. David Leeming is Professor Emeritus of English at the University of Connecticut in Storrs. He is the author of many books on mythology, including The Oxford Companion to World Mythology (2005).